Launched in 1994, Tribal Art Magazine has now produced 80 issues, each consisting of around 150 richly illustrated pages. Authored by a wide variety of international specialists, reference articles, exhibition reviews, interviews with major players in the world of art, history of objects and collections and news about the current tribal art market, make for exciting issues, each rich in visuals of some of the best examples of material culture produced by traditional peoples around the globe. Tribal art Magazine is produced, edited and distributed by PRIMEDIA editions in the entire world, from Anchorage to Auckland and thousands of locations in between. Australia’s oldest Aboriginal fine art business (1981) and located at iconic Bondi Beach. The Gallery specialises in historically important bark paintings. 19th and 20th century artefacts, early desert boards, as well as high quality contemporary paintings and sculptures. Tambaran’s objects have been exhibited and sold to major museums in the world since 1979. The Tribal Art Brokers website presents quality Oceanic, Australian, South East Asian and African pieces offered for sale by Australian private collectors, as well as artworks sourced in Australia by its principal, David Said. The site also offers downloadable articles on tribal art. 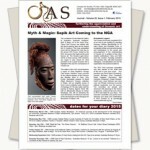 Tribal Art Brokers is an on-line gallery updated monthly. Art Historian turned art dealer Michael Hamson specialises in investment quality Melanesian art, and is recognised as a world expert on the art of the Abelam people. His Gallery features an ever changing selection of carefully selected Oceanic Art, much of it personally collected on Hamson’s frequent field trips to New Guinea, and the website is updated regularly. Oceanic Arts Australia are specialists in museum- and investment-quality Oceanic art from Australia, New Guinea, the Solomons, Vanuatu, Fiji, Polynesia and Micronesia.Principal Todd Barlin is well known for his extensive field collecting in West Papua. A representative selection of artworks can be viewed on the web site, and the gallery itself is open every Saturday,or by appointment at any other time. Tribal Collective is maintained by Angel Bottaro and Joel Gauvin. We are a couple who are lucky enough to share a common passion for Tribal Arts. We work from our home office in Melbourne (Brunswick), where most of our collection is available for viewing by appointment.Tribal Collective specialises in the art and artifacts of the Australian Aborigines and of the various cultures of the Pacific region, and our inventory always includes interesting objects from further afield. Tribalmania Gallery features a quality selection of Antique Polynesian, Melanesian, Indonesian and Australian Aboriginal Art. The popular website is continuously updated averaging 700 visitors daily and is maintained by Michael Auliso. Content includes reviews of most of the international Tribal Art shows and fairs. The majority of artworks are Melanesian – because that is my greatest interest – but I always have some examples from Polynesia, Micronesia and Australian Aboriginal art. Collecting artworks and travelling in the Pacific – particularly to New Guinea – has been my life for the last 30 years. The objects you will see here are both from old Australian collections or field collected from the remote corners of Oceania. The appreciation of historic exploration mixed with an interest in collecting, particularly within the fields of science, lead to the world of ethnographic artefacts. Particular interest is the art and artefacts’ of the Australian and Oceanic regions. Objects offered on the website mostly have been obtained from established collections and old family estates. Ewa Oceanic Art Gallery is a family run gallery specializing in tribal art from the Sepik region of Papua New Guinea. Tribal Art Gallery in Brisbane, QLD. Ron Perry and Carolyn Leigh published ‘New Guinea Tribal Art eGuide’. Wylda Byron is working on a book about her 18 months solo journey in PNG, where she documented the traditional dress of each of the 22 provinces she visited. Born in Puerto Rico, lives in NY, works everywhere. Shiva Lynn Burgos is the first contemporary artist to work in Mariwai, a small Kwoma village on the Sepik River in PNG since 2013. This is the origin of ‘The Mariwai Project’, a broad-reaching long-term two-way artistic and cultural exchange. Using photography and video as well both aerial drone technology and also the latest innovations in 360 degree virtuality filming, she documented the creation of a new spirit house.